** Digital download available as a 2-track package. *** The F4 Records press release lists the b-side as "Intro" but "Ego" is correct. 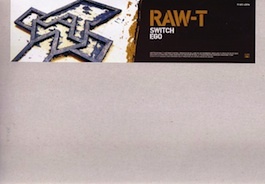 RAW-T (Realise And Witness Talent): Solja, Dreade, Mack D, Little G (MCs ); DT (Beats);-Flair, DJ Que (DJs). Sticker artwork based on a painting by Tigz at T-Productions.